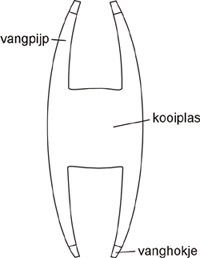 The name of the Kooikerhondje is irrefutably connected to the duck decoy. The Dutch name “Kooikerhondje” means “dog of the decoyman” or “decoy dog”.Duck decoys are originally a Dutch invention and known in its current form for more than 600 years. What does a duck decoy look like? A duck decoy consists of a pond with a couple of side-arms connected to it. This lake is most of the times surrounded by a sort of swamp bush which creates peace in the pond and also functions as wind protection. 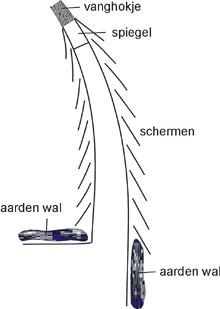 The side-arms can be compared with wide curved ditches, with little trap-boxes at the end of it. These pipes, covered with string netting, used to be covered with thorn-bushes to prevent ducks from flying away. On shore one can also find several screens on one side of the pipe. These screens, mostly build of reed mats are arranged in a half herringbone design. Which makes it possible for the decoyman and the Kooikerhondje to move freely without the notice of the ducks. Ducks permanently situated in the decoy are called decoyducks. Their task is to lure other ducks to the decoy. The decoyman could not catch the ducks on his own. Most of the times he got assistance from a small dog: the Kooikerhondje. Its colour varied from orange to yellow. Old engravings show long haired dogs as well as short haired dogs. But the most important thing for the decoy man was the utility of the dog, that was also one of the criteria for possible breeding. Every morning and every evening the decoyman selects a pipe, depending on the wind direction. The wind direction is quite important because ducks always fly towards the wind. Once the decoyman has selected a pipe he throws some food in it. The decoyducks know this and swim towards the food, which attracts wild ducks. Now its time for some Kooikerhondje action. 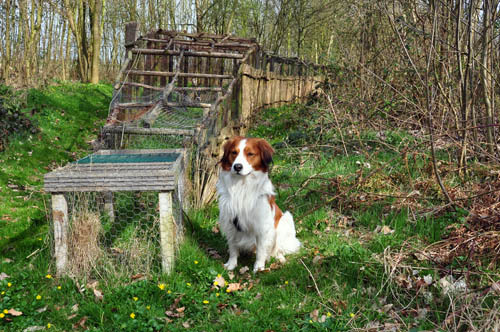 The Kooikerhondje walks, with the instructions from its master, back and forth behind the screen. The ducks can see his white or half-coloured plume every once in a while, they get really curious and follow the dog further into the pipe. The decoyman shows up when the ducks are far enough in the pipe, which scares them even more of course and which makes them fly further into the pipe. The decoyducks know the game and they swim back to the pond. It is not possible for the wild ducks to see the pool anymore once they are in the curve, so they swim towards the light at the end of the pipe, because the decoyman keeps everything on purpose very low covered. When the ducks are in the trap box, it is closed by the decoyman. Walking up and down behind the screen is a very specific task of the Kooikerhondje. A good plume is therefor really important. kooiker_vangpijp The ducks get really curious because of the fact that they do not see the plume all of the time. The work in a duck decoy has to happen soundless of course, because barking could scare the ducks. That is why the decoyman taught the dog not only to react on his voice but also on signs. There has to be a silent co-operation between the dog and its master; this makes it even possible for the dog to work on his own if necessary. Of course he still pays attention to the movement of his boss. In the previous century the Kooikerhondje was not allowed to leave the decoy field, not even at night, that is why he is used to being alone in the decoy shed. The Kooikerhondje has another important task besides attracting ducks, namely destroying vermin. Especially during the breeding season of the ducks. The decoy business does not only concern catching ducks, but also concerns the supervision of the decoy bushes, the pond etc. The original decoy business is a unique co-operation between the ducks, the decoyman and the Kooikerhondje. It is a typical example of catching birds with birds, it is not a drive but it is a hunt with the help of tempting. It requires quite a lot of dedication, patience, professional knowledge especially about the behaviour of ducks and the dog. Peace and silence are really important. There are still approximately 100 duck decoys in The Netherlands; most of them are involved in scientific research. The decoyman still gets assistance from a Kooikerhondje in some cases.